"As we navigate through the economic miasma, Congress has to keep in mind one of the greater long-term dangers that America faces: the flight of venture capital from a United States seen by many investors as stagnant in its growth prospects -- and competing with places like India and China and other emerging nations that look to have much more robust growth for several years." Click here for details. Additioanlly, we'll post more information as we have it on this page. JUST CONFIRMED: EDC Client EXPO adds National Keynote Speaker, Richard Bendis, at 5:00 pm, prior to exhibit hall opening. Hear from this successful entrepreneur, distinguished economic developer, Obama Transition Team consultant, and Venture Capitalist. While Washington has staked hundreds of billions of dollars on increased spending to stimulate growth in the economy, statehouses across the country are poised to cut allocations for sponsored venture funds in a bid that could hurt their ability to fund high-tech start-ups. Most U.S. states do some kind of venture investing, often taking LP stakes through pension funds and other vehicles. But roughly half the states also make direct investments, or have affiliated agencies that do. Since the 1980s, dozens of legislatures have formed agencies to make direct equity or convertible note investments in start-ups to promote high-tech economic development and job creation in their states. Typically they behave like early-stage venture firms, except that the limited partner is the state. "The government believes this could leverage enough private investment to build a fund of up to £1bn (€1.18bn) over the next ten years. The UK Innovation Investment Fund forms part of the government’s strategy for Building Britain’s Future. " Can Governments Till the Fields of Innovation? INNOVATION - the tricky, many-step process by which ideas become products and services - has typically been seen, studied and celebrated at the micro level, as a pursuit for entrepreneurs and clever companies. But governments are increasingly wading into the innovation game, declaring innovation agendas and appointing senior innovation officials. The impetus comes from two fronts: daunting challenges in fields like energy, the environment and health care that require collaboration between the public and private sectors; and shortcomings of traditional economic development and industrial policies. Innovation policy, to be sure, is an emerging discipline. It lacks crisp definitions or metrics. The most explicit embrace of it has been outside the United States, though the Obama administration is taking some initial steps. Its new budget directs the Bureau of Economic Analysis to develop statistics that "uniquely measure the role of innovation" in the economy. And the government's new chief technology officer, Aneesh Chopra, speaks of building "innovation platforms" to spur growth. The rising worldwide interest in innovation policy represents the search to answer an important question: What is the appropriate government role in creating industries and jobs in today's high-technology, global economy? That central issue animated much of the discussion at an unusual gathering earlier this month at a lodge north of San Francisco. This invitation-only affair was organized and moderated by John Kao, a former professor at Harvard Business School and founder of the Large Scale Innovation. A few speakers covered big-think issues like climate-altering geoengineering and water-management technologies. But the main participants were innovation-policy practitioners from nine countries: Australia, Brazil, Britain, Chile, Colombia, Finland, India, Norway and Singapore. The meeting offered a window onto the state of innovation policy - how it is being defined, and what countries are doing. 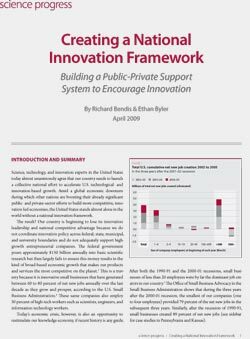 Above all, innovation policy is an attempt to bring some coordination to often disparate government initiatives in scientific research, education, business incentives, immigration and even intellectual property. "It's about setting an agenda and helping build a portfolio of skills that let an economy and a society move forward in smarter, faster ways," Mr. Kao said. Yet if the reach of innovation policy is broad, the attendees agreed, it is best done with a lighter touch than industrial policies of the past, which often focused on specific companies for government support. They used metaphors like "impresario" and "orchestra conductor" to describe government's role. The ideal, they said, is "stewardship," not command and control. In Britain, a national innovation agenda is beginning to take shape with policy documents and the creation of a Department for Business, Innovation and Skills. "We're determined not to second-guess the future by trying to pick winners and losers," said Philip Rycroft, a senior government official overseeing innovation policy. "But we do think government can create the conditions so that new industries can rise more easily." Finland has long taken a comprehensive approach to innovation policy, investing in areas as varied as an outstanding national education system and high-speed Internet connections for its residents. It has also produced a power in the cellphone industry, Nokia. But Mikko Kosonen, president of the Finnish Innovation Fund, a public investment fund, says Finland now needs an "innovation policy 2.0" to climb the economic ladder to remain competitive. "We see value migrating to software and services," he explained. The country has the second-fastest-aging society in the world, after Japan, and its health care costs are rising rapidly. To turn that challenge into a growth engine, Finland intends to become a global leader in developing software and services for medical monitoring and preventive health services. "We think well-being services are the next big opportunity for Finland," said Mr. Kosonen, a former senior executive at Nokia. Other governments are also focusing on targets of potential advantage. In Australia, the government is looking to nurture industries that arise from its harsh climate and a scattered population. So research centers are working to improve strains of drought-resistant wheat and cotton for export as adaptive technologies to cope with climate change, said Terry Cutler, who recently headed a government-appointed expert panel on innovation in Australia. And Boeing last year selected Australia as the location for a Phantom Works lab for developing unmanned aircraft, he said. "Test flights don't bump into things," he said. "Sparsity can be a global competitive advantage." In India, the government and industry have financed research into products and services that reverse the traditional pattern of innovation flowing gradually from wealthy nations to the rest of the world, said R. A. Mashelkar, chairman of the country's National Innovation Foundation. Early evidence of the trend, he said, includes the $2,000 Nano automobile, and low-cost drugs for tuberculosis and psoriasis. "If you make something for the rich, the poor cannot afford it," Mr. Mashelkar said. "But if you design for the poor, everyone can afford it." CLEARLY, the innovation meeting in California was a gathering of enthusiasts. One view not heard was that innovation policy itself is a mistake - government meddling in decisions best left to the marketplace - as free-market purists contend. Lars Aukrust, executive director for innovation at the Research Council of Norway, answered that criticism by comparing a nation with a large corporation. "If you are going to run a big company," he said, "are you going to leave it all to serendipity or make some strategic choices?" "Innovation policy is a probability game," Mr. Aukrust added. "You can improve the odds of success." 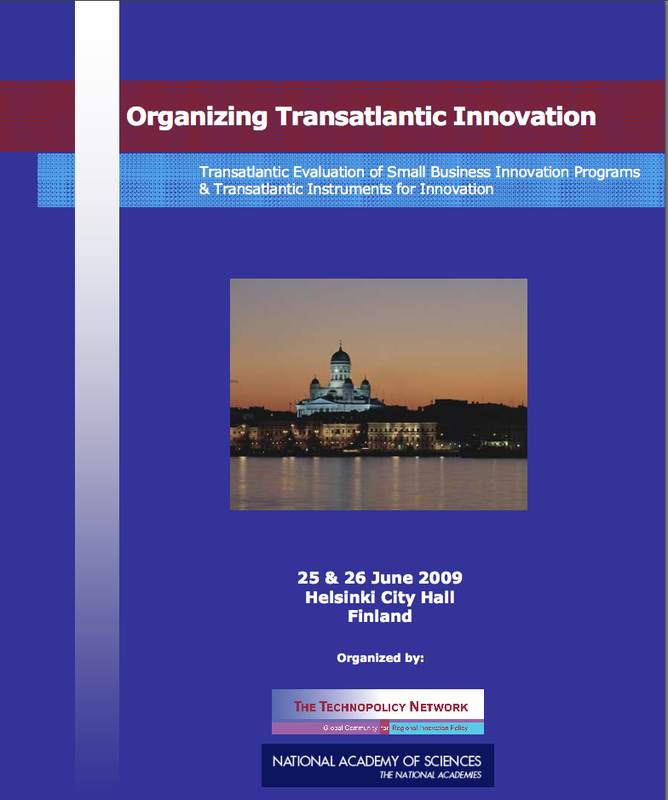 Richard Bendis traveled to Helsinki, Finland and presented at the Organizing Transatlantic Innovation conference. The conference took place on Thursday, June 25 and Friday June 26th. His presentation, Managing Transatlantic Opportunities through Innovation Intermediaries, was given at 9:40AM on Friday, Just 26th. A copy of that presentation is here. Click on the icon to the left for the conference agena. President Obama’s new Small Business Administration chief is mapping a more aggressive role for the agency, including finding more ways to aid fast growing, innovative companies. Administrator Karen G. Mills wants to give small businesses more of the tools they need to compete effectively in the national and global marketplaces. In an interview, she said that she wants to break from the past, when the SBA had a “one size fits all” approach. Richard Bendis, entrepreneur and president and CEO of Innovation America, a not-for-profit organization for entrepreneurial growth, is encouraged by Mills’ plans. “We would like to see a greater commitment to innovative entrepreneurial small business funding programs. This has not been a priority for the SBA in the past,” he says. "The health of the Canadian economy depends greatly on the vitality of Canadian businesses, which often need credit to finance their growth," said Minister Clement. "The Operating Line of Credit Guarantee will allow BDC to work with financial institutions to make it easier for Canadian businesses with strong balance sheets and business fundamentals to access the credit they need to get even stronger. The funding for venture capital will assist growth-oriented firms to get the funds they need to innovate and boost the Canadian economy." The Operating Line of Credit Guarantee will be delivered under the Business Credit Availability Program as part of the government's Extraordinary Financing Framework announced in Canada's Economic Action Plan, and it will improve access to financing for Canadian businesses during this period of economic uncertainty. I am pleased to announce two new Funding Opportunity Announcements (FOAS) that will be supported by funds provided to the NIH under the American Recovery & Reinvestment Act of 2009 (“Recovery Act” or “ARRA”). Application due dates for these FOAs are September 1.
Letters of Intent, though not required, are encouraged and are to be submitted by August 3, 2009. Note that one FOA is a pilot program and uses a new mechanism, called the RC1. This FOA aims to address the funding gap between promising research and transitioning to the market -- often called the “Valley of Death -- by contributing to the critical funding needed by applicants to pursue the next appropriate milestone(s) toward ultimate commercialization. The other FOA uses the SBIR Phase I (R43) activity code and encourages applications from small business concerns (particularly those without a history of NIH SBIR or STTR support) that propose to accelerate innovation through high risk, high reward R&D projects with commercial potential and that are relevant to the mission of the NIH. I encourage you to review these FOAs and hope many of you will be able to take advantage of the opportunities. Please feel free to contact the Institute/Center staff listed in the FOAs to discuss potential projects. NOTE: IF YOU ARE NOT REGISTERED IN BOTH GRANTS.GOV AND eRA COMMONS, BE SURE TO START THE PROCESS NOW AS THESE REGISTRATIONS CAN TAKE AT LEAST 4 WEEKS AND ARE NECESSARY TO SUBMIT AN APPLICATION TO NIH. The revolving door of venture capitalists is swinging fast. Not since the dot-com bust has the industry experienced as much turnover as it is now. Since the end of 2007, the number of venture-capital principals, who make investment decisions and are directors of start-up companies, has tumbled by more than 15%, according to the National Venture Capital Association. This is the first solicitation for the Advanced Research Projects Agency – Energy (ARPA-E). ARPA-E is a new organization within the Department of Energy (DOE), created specifically to foster research and development (R&D) of transformational energy-related technologies. Transformational technologies are by definition technologies that disrupt the status quo. They are not merely better than current technologies, they are significantly better. Often, a technology is considered transformational when it so outperforms current approaches that it causes an industry to shift its technology base to the new technology. The Nation needs transformational energy-related technologies to overcome the threats posed by climate change and energy security, arising from its reliance on traditional uses of fossil fuels and the dominant use of oil in transportation. An interesting article about Innovation and Japan from the Economist. THE most important factor that led to America’s stunning success in information technology was not the free market but government regulation. Federal trustbusters made AT&T lease its lines to others and eventually broke up the giant telephone company. Later they forced IBM to separate its hardware and software businesses. These actions opened the door to competition and lower prices. More important, they changed the industry’s structure, replacing monoliths with smaller, specialised companies which have to work with others with complementary skills. The result has been tremendous innovation. "Nations are constructing lavish science parks, often with big city amenities, to gain a competitive edge in the global economy"
Here's an interesting article about what's happening with research parks and their future. Check it out here. Eric Billingsley recently caught up with Jim Jaffe of the NASVF. "At least 30 U.S. states have committed a total of $2.37 billion in investment capital for programs that encourage the growth of companies ranging from pre-seed to later stage, according to a March 2008 report by the NASVF. Some of the largest programs include: New Mexico, $536 million; Texas, $290 million; Ohio, $212 million; Michigan, $204 million; and Pennsylvania, $68 million, according to the NASVF. Richard Bendis, CEO of Innovation America and James Jaffe, President of NASVF were interviewed recently by VCExperts.com Below are excerpts from that artcle. Innovation America along with its partner, NASVF continue to get press about their initiative. Innovation America releases a new version of its powerpoint outlining the goals and strategies for returning America to the top of the Innovation Race. James A Jaffee, President of the National Associate of Seed and Venture Funds (NASFV), recently published, More Signs of Capital Starvation, on forbes.com. In it he notes the results of the survey recently conducted by the NASVF. "Says Richard Bendis, founder of Innovation America: "If we don't get $2 billion, the goal is get some allocation of new funds for at least a pilot program by the end of this year."" April 23, 2009 Philadelphia, PA - Innovation America, the National Association of Seed and Venture Funds and Science Progress released a new report, “Creating a National Innovation Framework,” which recommends the creation of key initiatives to encourage innovation through new private-public partnerships. The report was authored by Richard Bendis, president and CEO of Innovation America and Ethan Byler, the Keystone Innovation Zone Coordinator at the Pennsylvania Biotechnology Center in Doylestown, Pennsylvania with input from the American Society of Mechanical Engineers, National Association of Seed and Venture Funds, Science Progress and the National Academies of Science. The result? Our country is beginning to lose its innovation leadership and national competitive advantage because we do not coordinate innovation policy across federal, state, municipal, and university boundaries and do not adequately support high-growth entrepreneurial companies. The federal government pours approximately $150 billion annually into basic scientific research but then largely fails to ensure this money results in the kind of broad-based economic growth that makes our products and services the most competitive on the planet. This is a travesty because it is innovative small businesses that have generated between 60 to 80 percent of net new jobs annually over the last decade as they grow and prosper, according to the U.S. Small Business Administration. These same companies also employ 30 percent of high-tech workers such as scientists, engineers, and information technology workers.